The Garden of Sciences is an information center for all to make sciences popular and understandable per everyone, as well youngers as olders. Indeed, the purpose of the center is to make the world of science and our environment interesting and attractive "witness of the past but looking to the future." The Pavilion de l'Arquebuse is a museum that presents in an attractive way how biodiversity is in place on our planet, what are the relationships between nature, humans and their environment, and what is the importance of preservation of biodiversity. Pavilion Raines meanwhile promotes science news and regularly updates its temporary exhibitions on themes directly related to science. It has a weather station connected to the Meteosat satellite that allows visitors to make their own weather predictions. The botanical garden, magnificent space for local cultivated and wild flora but also with varieties coming from the five continents, offers fun and poetic balads through the arboretum, the School of Botany, and the small and large Orangeries that are hosting the cabaret science and naturalist painters artists exhibitions. It also offers you the opportunity to walk in a rich garden that hosts more than 230 varieties. - An experimental and multimedia room designed to accommodate the young people, especially school children, to introduce them to the scientific process through appropriate and innovative teaching tools. The Garden of Science is open from 09:00 to 12:30 and from 14:00 to 18:00 (closed on Sundays at 19:00 from May the 2nd to August the 31th). It is closed on Tuesdays, Saturday mornings and Sunday mornings. The planning of the planetarium projections is available by clicking here. Disclaimer : The management team of the destination has the possibility to change the opening days and hours without prior communication. 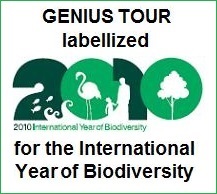 Genius Tour is very pleased to present this comprehension science center, playful and fun for everyone , the young and the old, and whose interest is fully shared by our editorial. It is to awaken the youngers to the mysteries of science and to answer to their questions. To visit the Garden of Sciences alone, in a group or in family, will allow you to discover additional aspects of Human environment in its past, present, and future.